Unique, Functional Art...Hand Painted Glassware Created by EverMyHart is available for purchase at my Etsy.com shop and there are many more items available there. I have pictures here, but purchases are now only available from my Etsy store. Host aWine & Glass Painting Party!!! 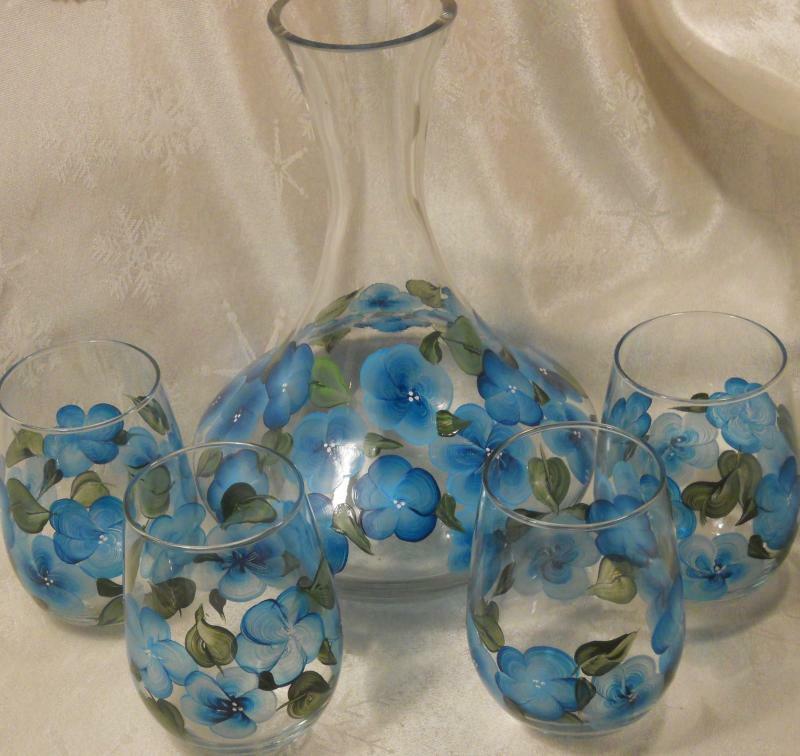 A Wine & Glass Painting party is a great way to get friends together and have fun! And, Ladies, don't just limit it to a Girls' Get-together! We have had some amazing couples parties! So gather 8-10 (or more!) couples together for an afternoon or evening of fun! Wine & Glass Painting Party!!! Live, Laugh, Love & Be Happy!! This is a one of a kind find for a carafe! And pair it up with 4 matching glasses! Any custom order will have pictures emailed for confirmation before heat-setting and shipping. Most pieces will ship within a few days of order, as I paint each order as received. How-ever, I usually have some stock on hand, if you need an item "quick" shipped. Again, please contact me! 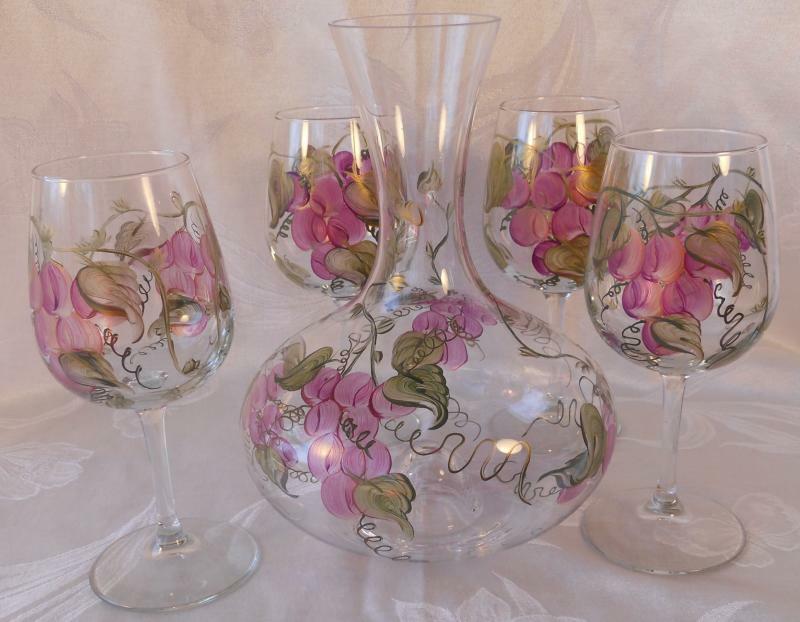 Glassware: All designs are painted free-hand style, which means that while a basic pattern will be carried to several pieces, no two pieces will be exactly alike. And as such, please feel free to mix and match color and styles for a unique collection! I have an extensive (over 75 colors) rainbow of colors...if you have something specific in mind, please contact me. 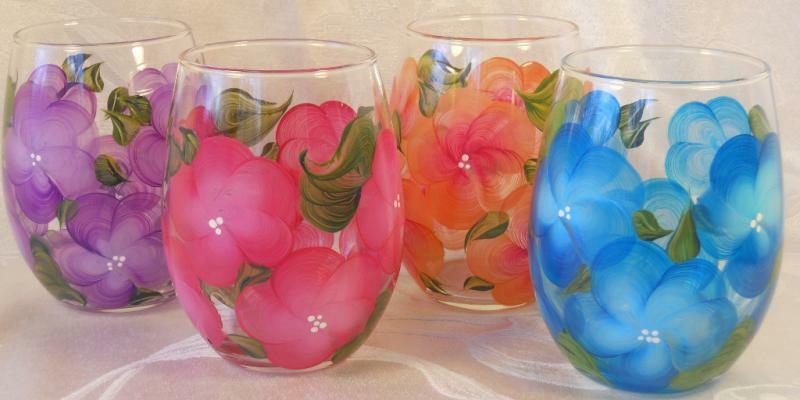 Specific glass styles, colors and pattern may vary. The paint is rated dishwasher safe, top rack; however, I strongly recommend hand washing as you would any fine glassware, no harsh chemicals and do not soak, to preserve the brilliance of the colors. Please check back often as new designs will be coming out soon. If you have questions, please contact me. I will email pictures of any special order before it is heat set. Created by EverMyHart. All rights reserved.